The Slaughter Pen view of the flooded Plum Run (Bloody Run). The Slaughter Pen “pool” area is shown in the foreground. In the middle distance is the bridge which passes over Plum Run from the Devil’s Den parking lot to the Slaughter Pen restroom, and then the trail to Big Round Top. Little Round Top is in the background. View is from the southwest facing northeast. Approximately 4:00 PM February 26, 2008. 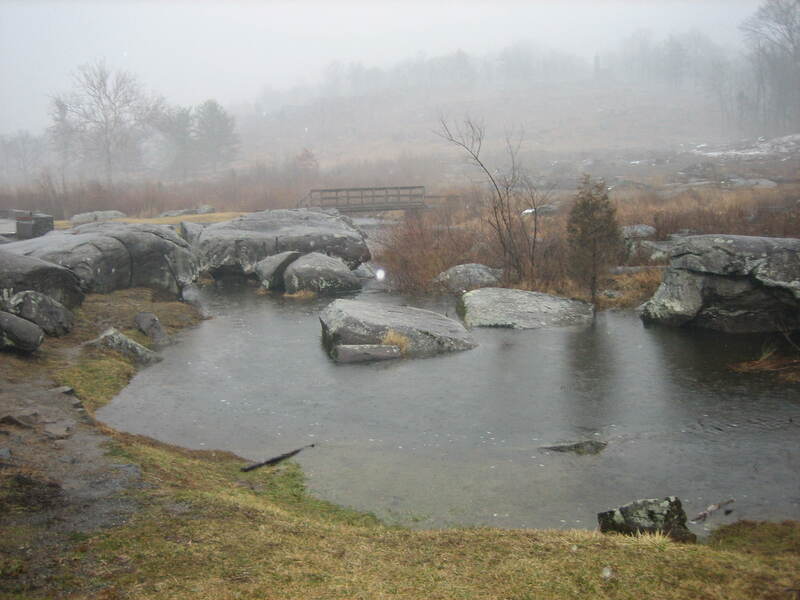 The big event today was the amount of rain in the Gettysburg area. 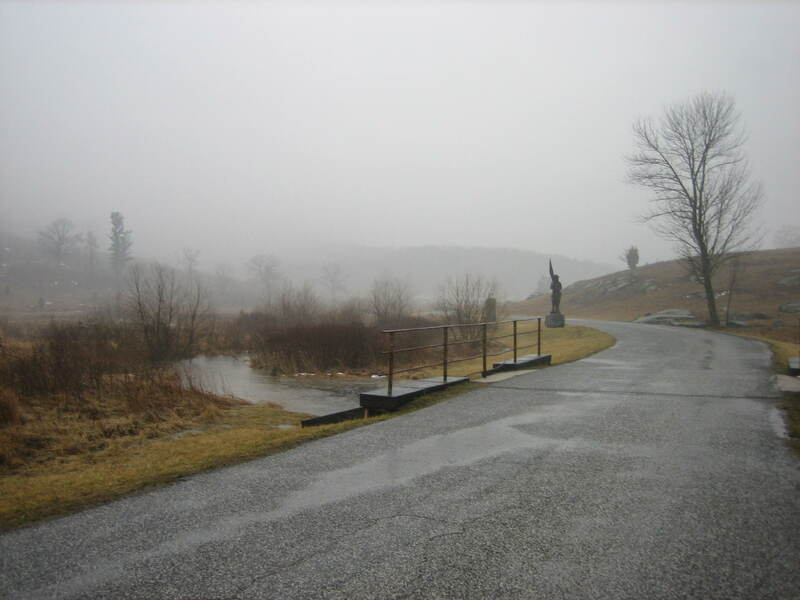 The recent accumulation of snow continued to melt and clouds hugged the ground throughout the area, giving the day its own dreary beauty. The Gettysburg Daily took a few pictures this afternoon in Gettysburg National Military Park’s Plum Run Valley (Valley of Death). 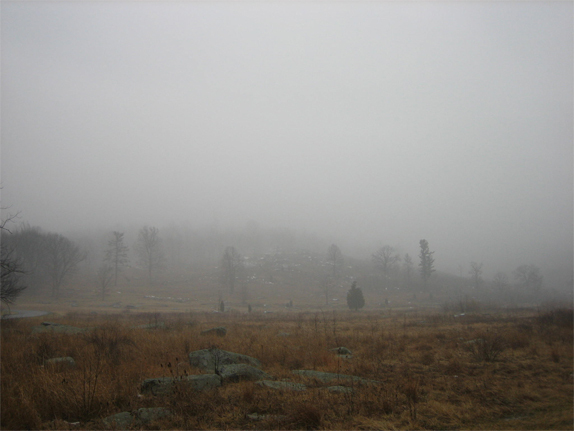 View of Little Round Top from Crawford Avenue near the bridge over Plum Run (Bloody Run). View is from the northwest facing to the southeast. Approximately 4:00 PM February 26, 2008. Plum Run Valley or the Valley of Death. 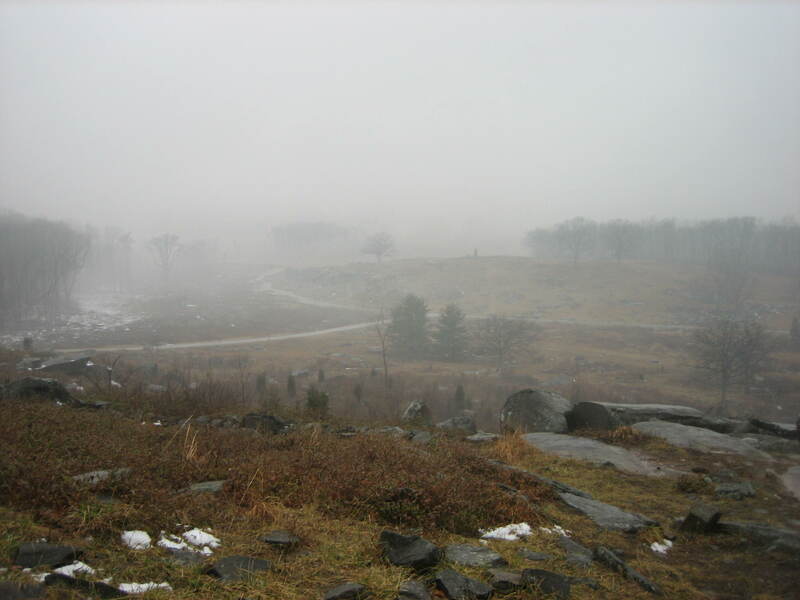 The bottom of Little Round Top is in the left distance. 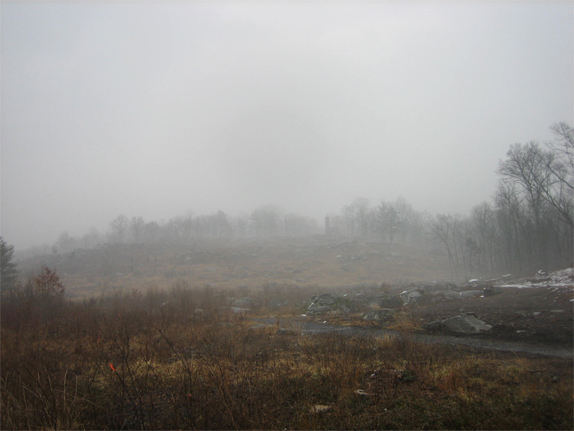 The bottom of Big Round Top is seen in the middle distance. Houck’s Ridge is seen to the right. In the foreground is the bridge on Crawford Avenue which passes over Plum Run (Bloody Run). The Samuel Crawford statue is in the background. The flooded Plum Run is seen to the left (southeast) of the bridge. View is from the north facing south. Approximately 4:00 PM February 26, 2008. 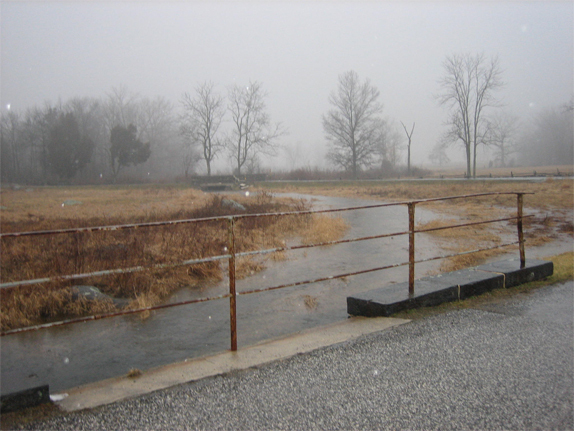 The flooded Plum Run (Bloody Run). The bottom of Little Round Top is in the left and middle distance. The bottom of Big Round Top is seen in the right distance. This view is from the bridge on Crawford Avenue which passes over Plum Run. View is from the northwest facing southeast. Approximately 4:00 PM February 26, 2008. 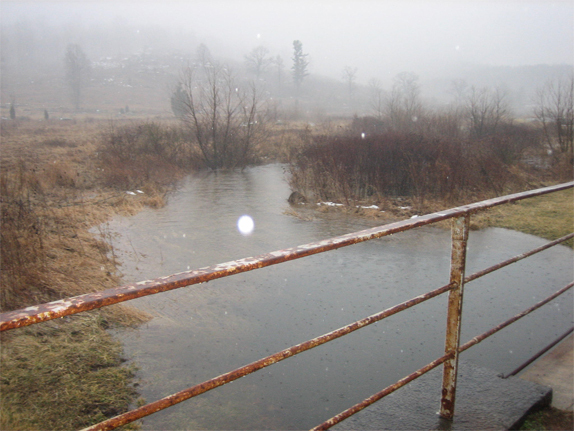 The flooded Plum Run (Bloody Run). The Wheatfield Road and the bridge which passes over Plum Run on the Wheatfield Road are shown in the background. This view is from the bridge on Crawford Avenue which passes over Plum Run. View is from the southeast facing northwest. Approximately 4:00 PM February 26, 2008. The Slaughter Pen view of the flooded Plum Run (Bloody Run). View is from the bridge which passes over Plum Run from the Devil’s Den parking lot to the Slaughter Pen restroom, and then the trail to Big Round Top. Devil’s Den is in the right background. View is from the northeast facing southwest. Approximately 4:00 PM February 26, 2008. 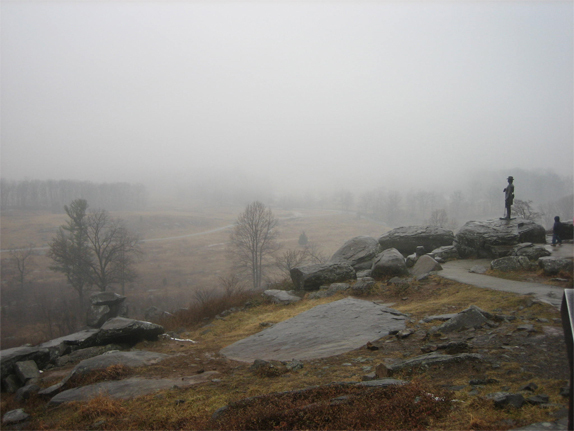 Little Round Top from the Slaughter Pen/Devil’s Den area. View is from the bridge which passes over Plum Run from the Devil’s Den parking lot to the Slaughter Pen restroom, and then the trail to Big Round Top. The trail in the foreground is part of the former Gettysburg trolley line. View is from the southwest facing northeast. Approximately 4:00 PM February 26, 2008. 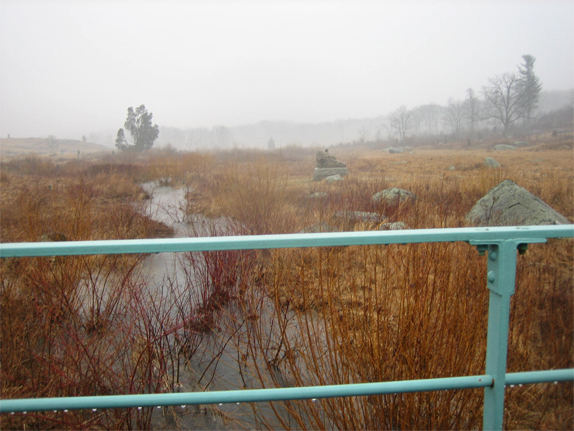 Plum Run Valley (Valley of Death). 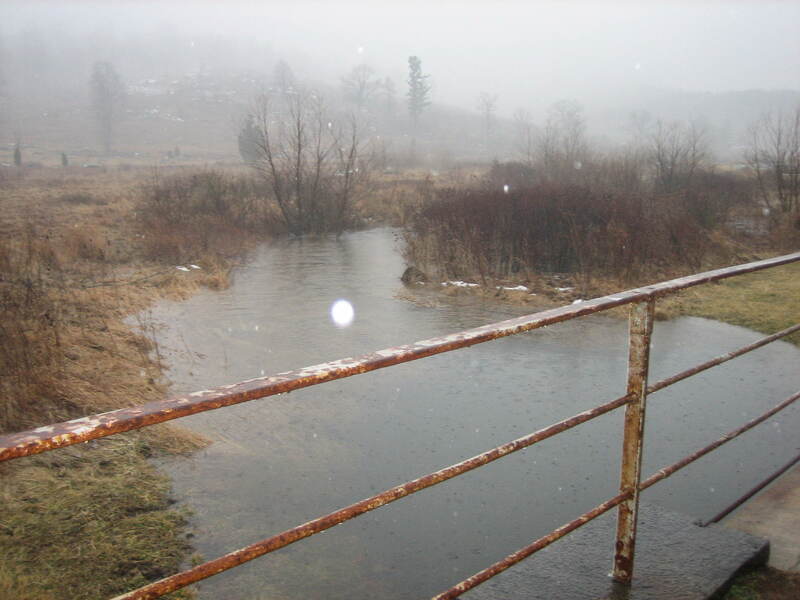 The Slaughter Pen view of the flooded Plum Run (Bloody Run). View is from the bridge which passes over Warren Avenue. In the middle distance is the monument to the 40th New York Infantry Regiment (Mozart Regiment). Houck’s Ridge is in the left background. The west slope of Little Round Top is in the right background. View is from the southwest facing northeast. Approximately 4:00 PM February 26, 2008. 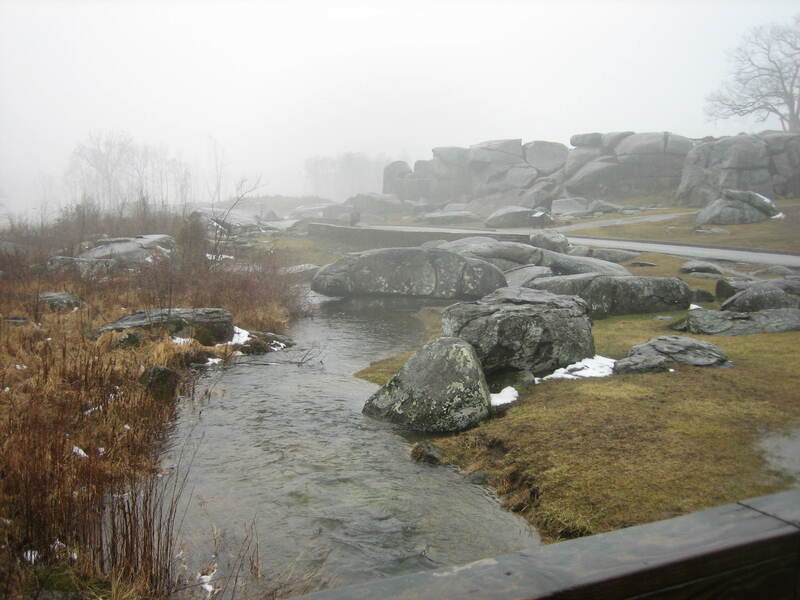 Little Round Top. View is from the southeast facing northwest. The statue to Gouvenour K. Warren is shown against a background of fog. Members of a school group approach the statue from the right. 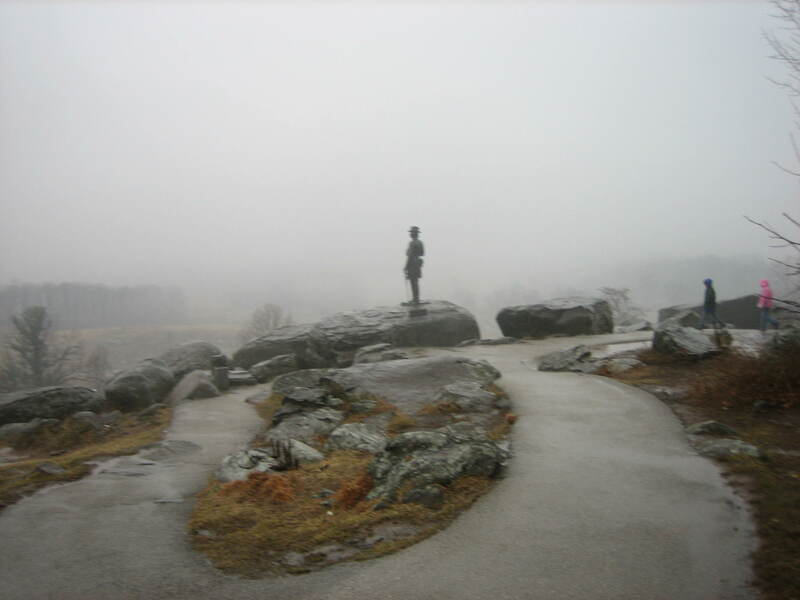 Unfortunately their visit to Gettysburg did not allow for the clear view many of us have had from this location. Approximately 4:05 PM February 26, 2008. Little Round Top view of the Slaughter Pen and Devil’s Den. View is from the northeast facing southwest. Approximately 4:05 PM February 26, 2008. 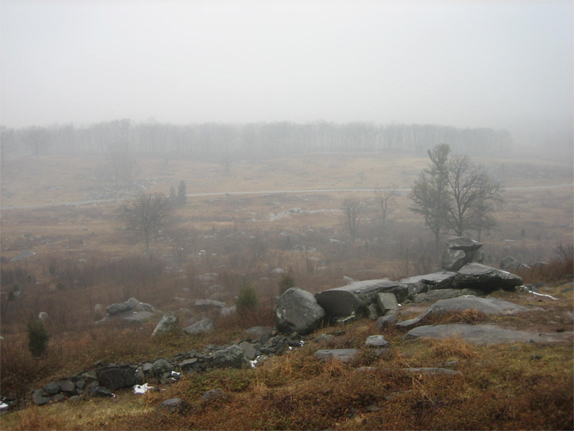 Little Round Top view of Houck’s Ridge and Plum Run Valley. View is from the east facing west. Crawford Avenue is in the middle distance, and the flooded Plum Run can be picked out just below Crawford Avenue in the center of the photo. Approximately 4:05 PM February 26, 2008. Little Round Top view of The Wheatfield and Plum Run Valley. View is from the southeast facing northwest. The statue to Gouvenour K. Warren is shown on the right side of the photo. Approximately 4:05 PM February 26, 2008.